Little more than a month into the new season, Hawkes Racing has brought up its 12th three-year-old win with Swear taking out the Ming Dynasty Quality at Randwick. Co-trainer Michael Hawkes said the colt was an example of the team's patience with last season's juveniles which was now paying off. Swear made a winning debut in April after which he was given a rest to prepare for his three-year-old year. 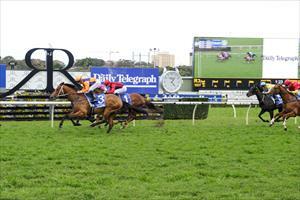 Punters jumped on the Hawkes wagon, backing the colt from $5 to $3.80 in Saturday's Group Three race over 1400m. He travelled on the pace, and although not really comfortable on the heavy ground, Swear held off High Mist ($5) by a half length. Skylight Glow ($7.50) held on for third another short half head away after leading for most of the race. "A lot of these horses have just needed time and it's about quality over quantity for us," Hawkes said. "We have patient owners and that helps. It's just a matter of getting them in the groove. "He wasn't that comfortable in the ground but his class prevailed."